Analysis: On the heels of posting career bests in both kickoff (1,174) and punt (324) return yards last season, Roberts earned All-Pro and Pro-Bowl honors. 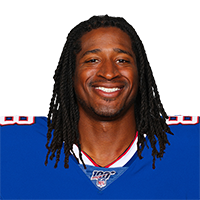 He'll now move within the AFC East from the Jets to the Bills, where he should take on a similar workload on special teams. When it comes to offensive contributions, however, Roberts will have a tough time nudging fellow receivers John Brown, Cole Beasley, Robert Foster and Zay Jones out of the lineup. Analysis: On the same day the Jets let 2018 Pro Bowl kicker Jason Myers walk in free agency, the organization will now apparently cut ties with another special-teams Pro Bowler in Roberts, a standout kick returner. While Roberts should command heavy interest on the open market as a return man, it's far too early to speculate who might take over his former role in New York. Analysis: Roberts saw more action on offense than usual due to injuries to the Jets' wide receiver corps, but the majority of his value comes on special teams. 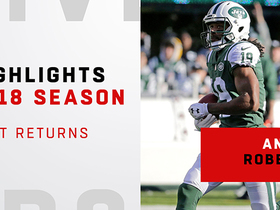 He was among the league's best returners this season, recording 132 or more kick return yards four times, while also topping that mark once as a punt returner and scoring a touchdown of each kind. There should be a robust market for the free agent's special teams services. Analysis: Roberts didn't make an impact on offense, but he was still a major contributor in this high-scoring affair thanks to some critical plays on special teams. 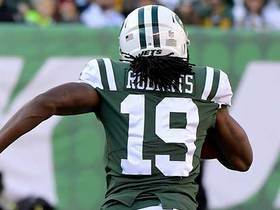 In addition to his 99-yard touchdown, Roberts set up the Jets' game-tying field goal late in regulation with a 51-yard kickoff return. Analysis: Roberts' 13-yard touchdown grab in the third quarter was just his second receiving score since the start of the 2015 campaign, as his impact primarily comes on special teams. His contributions in his usual capacity as a return man consisted of three kick returns for 71 yards and two punt returns for 22 yards. Roberts caught his lone target for 10 yards and added an 18-yard carry in Sunday's 26-22 loss to the Titans. Analysis: Roberts dealt with a minor foot injury during the week, but he looked healthy as ever in this one. 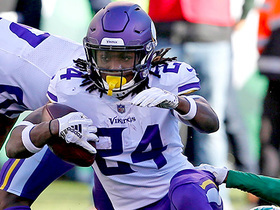 In addition to his pair of gains on offense, Roberts totaled 82 yards on two kick returns and four yards on a punt return. Roberts (foot) won't have an injury designation for Sunday's game at Tennessee, Turron Davenport of ESPN.com reports. Analysis: Roberts was added to the injury report Thursday as a limited participant, but his return to full participation Friday indicates it was a minor issue. 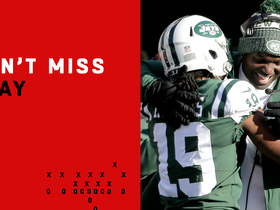 The 30-year-old should return kickoffs and punts for the Jets, per usual. Roberts (foot) was a limited participant in Thursday's practice, Andy Vasquez of The Bergen Record reports. Analysis: Roberts was a full participant in Wednesday's practice, so it remains to be seen where he picked up the foot injury. 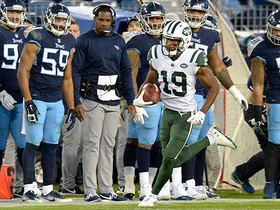 With Trenton Cannon's (hamstring) status for Sunday's tilt against the Titans also in question, the Jets could realistically be without either designated kick returner. If neither Roberts nor Cannon is able to suit up Week 13, one of Elijah McGuire or Deontay Burnett could see work returning kicks. Roberts (back) will play in Sunday's game against Miami. Analysis: Roberts came into Sunday with a rather murky forecast surrounding his availability, but, after holding up well through warmups, it seems the Jets feel content with his health moving forward. 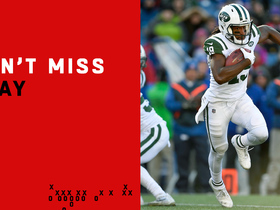 With both Robby Anderson and Quincy Enunwa suiting up, Roberts figures to have a minimal role in the passing game but should be the Jets primary return man. Roberts (back) is listed as questionable for Sunday's game at Miami, Darryl Slater of NJ.com reports. Analysis: Roberts was added to the injury report as a limited participant Thursday and did not participate at Friday's practice, so he's currently trending in the wrong direction. Trenton Cannon would likely take over kick and punt returns should Roberts be unable to play Sunday. Roberts (back) was a limited participant in Thursday's practice, Darryl Slater of NJ.com reports. Analysis: Roberts was a surprise addition to Thursday's injury report, given that he was not listed to begin the week. The veteran return man should be considered questionable for Sunday's game against the Dolphins. 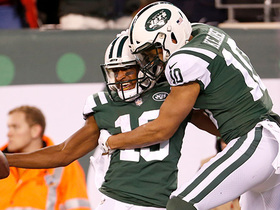 If Roberts is unable to suit up, Trenton Cannon would slot in as the Jets' starting kickoff and punt returner. 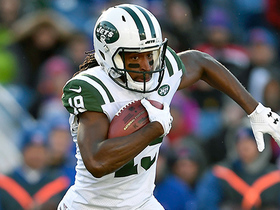 Watch wide receiver Andre Roberts' best returns from the 2018 season. 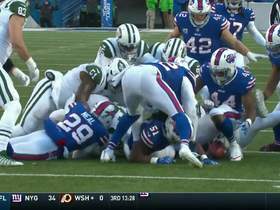 New York Jets quarterback Sam Darnold leads wide receiver Andre Roberts perfectly for touchdown toss. 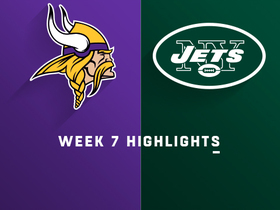 Minnesota Vikings cornerback Holton Hill intercepts overthrown pass from New York Jets rookie quarterback Sam Darnold.